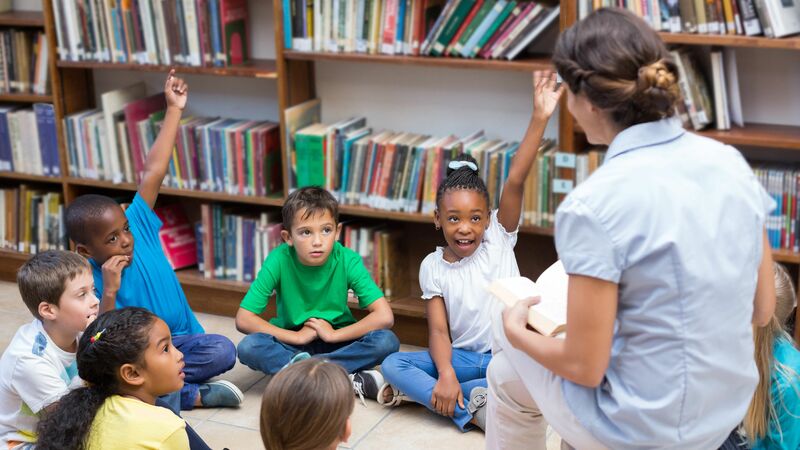 Get elementary students more excited about reading with these easy-to-implement community literacy projects. Most teachers are hopeful that their students will be more than just competent readers—we want them to be passionate readers. But schools can’t foster this passion alone. If we want to help our students become lifelong lovers of text, we must engage the community in reading and writing. Our students must see literacy as a natural part of everyday life, not just a school thing. I’m the librarian at an elementary school in small-town St. Croix Falls, Wisconsin. I serve over 400 students in grades prekindergarten through 4 and am the self-appointed community ambassador for reading and writing. At the heart of this role is the work I do to collaborate with the wider community in several literacy activities each year. This work arises from two research-backed beliefs. Social proof theory: Robert Cialdini writes about the idea that one of the best ways to influence people is to help them see something as socially normal. In other words, people tend to do what they see others doing. When students see engagement in literacy activities as a social norm outside of school, they’re more likely to engage in extracurricular reading and writing themselves. Reading keeps the brain strong: I recently read about a study that showed that the brains of folks who read and write every day are up to a third healthier in old age than the brains of those who didn’t. That, coupled with the evidence I’ve gathered in over 20 years of teaching, leads me to take my role as the unofficial literacy ambassador very seriously. If we want a healthy society, we have to keep our brains strong. Here are four easy-to-implement community literacy projects. Give them a try to build social capital for reading in your own communities. Big Read, Little Read: The National Endowment for the Arts (NEA) promotes a community-wide read of a common novel, an experience called Big Read. In St. Croix Falls, I’ve partnered with the public library to promote what we call the Little Read. Together we choose a book that third- and fourth-grade students can read, buy as many copies of it as we can, and ask community members and students to read it independently. When, for example, the NEA’s Big Read was The Grapes of Wrath, our Little Read was Out of the Dust, and when the Big Read was The Round House by Louise Erdrich, the Little Read was the same author’s Chickadee. After everyone reads, we arrange for a picnic where students and community members talk about the book. This allows students to see that reading is something that adults who aren’t teachers love to do, that reading is more than something people do as schoolwork. Books Beyond Borders: Another collaboration between the school and public libraries is adapted from Reading Without Walls. Books Beyond Borders calls for students and community members to complete a bingo card by recording when they read about people and places that are different from the norm in St. Croix Falls. The card has a three-by-three square with a “free” space in the center, and as readers complete texts they write the titles in the boxes. A card is complete when all squares are filled in, meaning the reader has read eight books that expose them to the wonderful diversity of the world. Winners are drawn from completed cards, and together they celebrate with a meal of foods from all over the world (cooked by their librarians). Again, this brings students and community members together as they celebrate reading and learning about the world around them. Reading Friends: Reading Friends pairs mostly retired community members with reluctant or struggling readers at the school. The adult friends come to the school once a week to read with their student partners. Together they talk, read, laugh, and share thoughts about the books they’re reading. The adult friends are encouraged to bring their books to the school to show students that they choose reading as a way to relax and enjoy life. The message seems to resonate with students, and they are beginning to see reading as a real-world activity. Writer’s Conference: Once a year, I work with teachers and the wider community to facilitate a whole-day writer’s conference for third graders. I invite local writers—including newspaper reporters, published authors of books, poets, songwriters, bloggers, and journalers—to spend the day talking with and teaching students about their lives as writers. The students dress up in professional clothes, attend a keynote speech, and attend concurrent sessions on topics from nonfiction writing to punching up dialogue in narrative works. At the end of the day, they fill out evaluations, and the feedback always includes students’ joy to learn that they can write anytime they want outside of school. Each of the activities above has had a tangible impact in my community. In St. Croix Falls, most people will tell you that students read more now than ever before. Help your school be a hub of community reading and writing too—become your community’s literacy ambassador today.